TOS Crew 2011-2012 Vendor Awards! 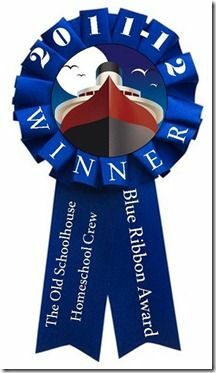 For the 2011-2012 School Year I have had the privilege to be a reviewer for The Old Schoolhouse Magazine's TOS Homeschool Crew. Each year, at the end of the year, the reviewers get to vote on the favorite and the best products of the year. The votes have been tallied and the results are in. Below are the results. For the products that I had the privilege to review, the product is linked to my review. For ones that I did not review, the product is linked to the TOS Crew Blog's Reviews page for the product. Congratulations to the winning vendors! TOS Crew hopes you will sail with the Crew again! Have you heard of Heritage History? I think I had heard of them, like something on the bare edge of awareness, like something off in the periphery that had buzzed at the edges of my vision, but something I had never turned my head to focus on. Well, they've got my attention now! I mean, they get a "Wow!" from me! You are inundated all day long with emails, blogs, websites, and reading, so let me remind you about who I am and how we homeschool so that you will understand why I am suddently so excited about this product. FlyMama Di and little JD (not so little any more) are the members of our 22-year-old homeschool. The first two attendees are now graduates. So, this spring I was selected to be among the blessed TOS Crew members who were given the opportunity to review products by Heritage History. 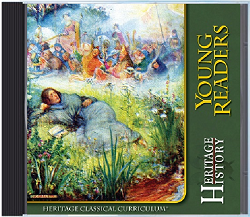 Available for us to choose from were the following CDs: Young Readers; Ancient Greece; Ancient Rome; British Middle Ages; and British Empire. Being unfamiliar with the company and the product, I took a quick look at their website, and asked for Ancient Greece. When I opened the CD and popped it into my computer, I was amazed! The Heritage History library is a collection of materials organized into collections, cross-organized by genre, reading level, author, and topic. It is amazing. (Wait.... I already said that, didn't I?) Heritage History not only has its own curriculum plan, but has crossed over any boundaries to make it easy to use their materials if you are using other curriculum plans as well. 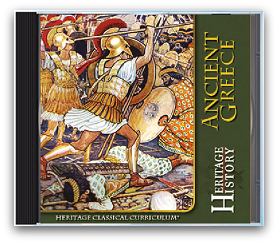 I feel inadequate to describe to you how wonderful the selection is on the Ancient Greece disk is, and how wonderfully the titles link up with the titles called for in the Ambleside Online curriculum. Turns out that the folks who produce the Heritage History CDs are aware of Ambleside Online. They even created a link showing what books on their CDs are books required by Ambleside here: Ambleside -- they actually even missed a few AO titles. Their disk also contains: Aesop for Children by Milo Winter and Stories from Shakespeare by E. Nesbit, plus many other titles able to be used as substitutions and potential supplementation, if one wants or needs to. There is a picture above of the printed Study Guide. 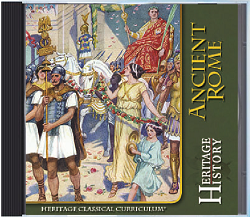 I did not receive a paper copy of this as a reviewer, however, Heritage History provides pre-printed Study Guides to accompany each of its Classical Curriculum CD's. Each Study Guide includes historical maps, outline maps, timelines, era summaries, character lists, battle dictionaries, recommending reading lists and other study aids. 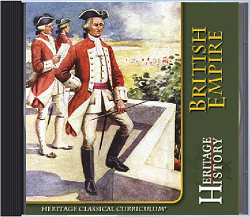 The Study Guides were designed to provide reference materials that complement the reading program and to assure instructors that their students remember the basic facts associated with each historical era. . The Curriculum User Guide gives helpful guidance and information throughout. Every document, every link, everywhere I turn on this disk is interlinked with more links, more information -- there is just so much here! The CD and the website combined are like an onion; every time I think I've gotten deeper, I find there are more layers! 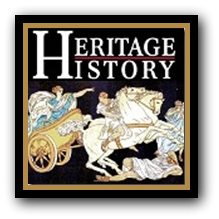 Heritage History's complete book texts and illustrations of over 400 classical narrative histories are available to view online (amazing!). 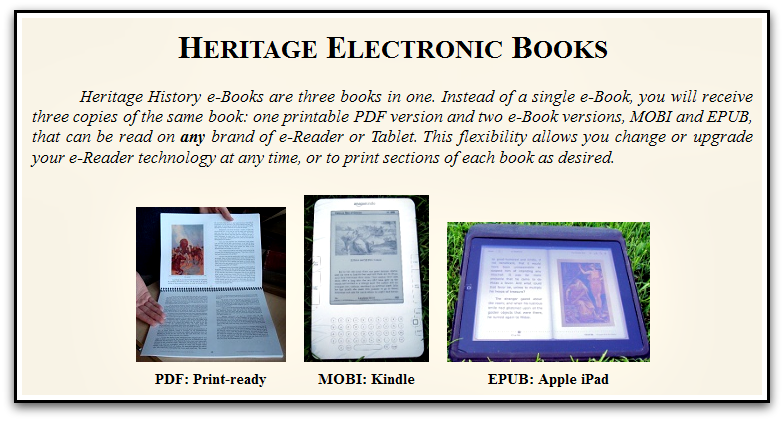 Their books can also be downloaded to any e-Reader or Tablet, for one low price. I had already known some of the titles are available in the public domain. But the format on the Heritage History CD is much nicer. Also, sometimes books from the public domain have typos and sections that are skipped. 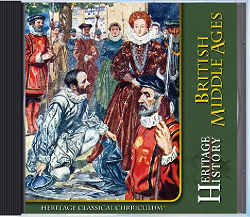 And the titles on the Heritage History CDs are in PDF format and are able to be transferred to your Kindle or other e-reader. This is so cool! When you are a user of living books, and a user of book-intensive curricula, sometimes when it is time to use a certain book, you go get your book, and it is lost, buried among all your other books. Using the Heritage History CD, it will always be easy to locate the digital copy. And any PDF document can be downloaded to a jump drive and taken to a printing shop to get a copy printed out and bound, if that's what you prefer. They actually have a free PDF book you can download to see what a sample book looks like. Go HERE to download a copy of Sir Francis Drake, by Mrs. O. Elton. 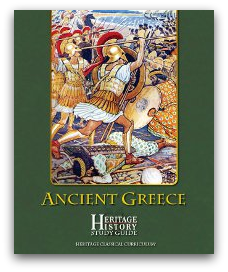 Heritage History's Ancient Greece library CD is available for $24.95. It contains Includes 46 books, 50+ maps, teaching aids, and a Study Guide. Format: CD, with printed Study Guide. Purpose of the product: to enable students to study History and Literature; to make rich, quality material easily available to the parent and the student. Topics covered: History, Literature, geography. What do I like? Everything! I'm amazed! What could be improved? I haven't found anything. Would I recommend the product? Absolutely! To whom? Anyone studying Ancient Greece. Anyone using Ambleside Online, Tapestry of Grace, and many other living-book-based curricula. Have I been surprised by anything in the material? I've been surprised since I first opened the case. 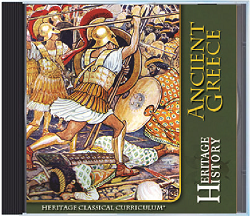 I received a Heritage History: Greece CD in exchange for my honest opinion in my review; I did not receive any pay. This has been a TOS Homeschool Review. To see more reviews of this product, go to the TOS Homeschool Crew Blog Entry for Heritage History. I love comments! Tell me what you think! In March I was selected to be among the crew members who would be reviewing Write Shop Junior, Book D. I was delighted. But before I received it, I began to have misgivings, and was developing a bad attitude. I didn't want another program that was going to give me a lot of work to do and yield minimal results. Boy was I wrong! What a fabulous program! WriteShop Junior is a very eye-catching program. It is laid out in a way that is systematic and easy to follow. It is laid out, step-by-step, but can also be used piece by selected piece, if the parent wants to target a specific skill or select lessons they know will work best with their students. This was very important for me, because my student can be difficult and resists new products, and I wanted to select assignments that he would find interesting as I eased him into using this new program. Ideal for students in 3rd and 4th grade. May also be used with reluctant 5th graders (and even some 6th graders). Start with Book D if your child has not learned punctuation or grammar skills and still needs help planning, organizing, and adding details to a story. More reluctant 3rd graders should start with WriteShop Primary Book C.
My son has had a lot of creative writing experience, but it is all self-generated, unproofed, unedited. I want to work with him to help him learn to receive a writing assignment, brain storm, crank out a paper, and be prepared to have it reviewed, marked up for editing, and then given back to him to polish. Kids all seem to want their first draft to be accepted as a final paper with not corrections. I haven't yet eased him into those other steps of the writing process. This program holds my hand (and his) as we walk through those steps. 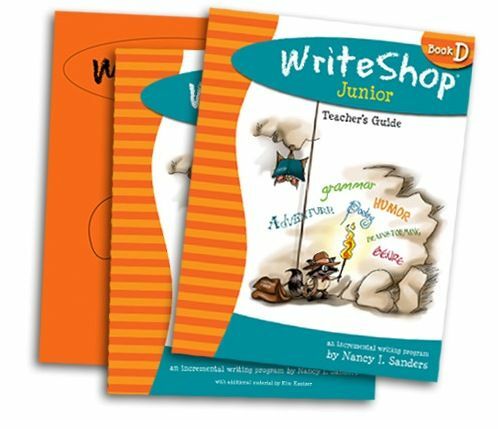 I received a digital download of the Write Shop Junior, Book D Teacher Guide, Student Activity Pack, and Time Saver Pack. I love the portfolio style of the Teacher Guide e-document, but it is also daunting. I would have much preferred to receive copies in print, just so you know. It is worth it to spend the extra money to get the printed copies when you have only one student. Maybe digital is better when you have multiple students. I just love this program! I love the creativity, the layout, and the format! I can't wait to walk through more of the material. Believe it or not, right now my favorite part of the material is the Appendix to the Teacher's Book, but that's only because it is absolutely amazing! It is stocked full not only with wonderful suggestions for finishing and displaying the writing assignments, but it is also chock-full of internet resource-links for more information, ideas, and resources. I am sure that, as I use this program, my favorite section will change every week or so, it is just that good. 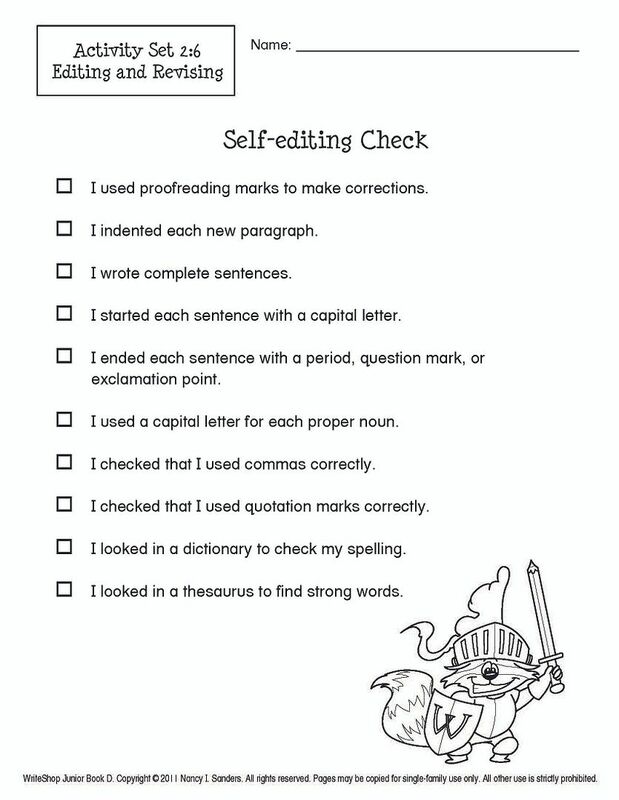 HERE is a look at a sample lesson, and HERE is a look at a self-editing sheet for the students. Write Shop carries products to help parents of students grades K through 12 to not only get their writing going, but also to improve their writing skills. While the WriteShop Junior I received does not stand as a full grammar program, it does reinforce the teachings of grammar, punctuation and vocabulary as it enables the student to improve their writing skills. The program introduces new tools for the parent and student to use to target weak areas and strengthen deficient skills. WriteShop was created by homeschooling moms. You can learn more about the company be reading the story behind the program. WriteShop is also the home of StoryBuilders and WordSmith Apprentice. I found the WriteShop website to be a bit like a labyrinth. It is very deep, and a little difficult to find one's way around in. There are riches there, but you have to wander around a bit to find some of them, particularly the link to WriteShop Junior. I suspect it is a new product (published 2011) and not yet on all the site links. For instance, I would expect to find it on the same page that tells about WriteShop Prmary, Books A, B, and C, but it is not there. Does the program need any additional materials? Sometimes you'll make a copy; sometimes it wants a piece of card stock, a file folder, construction paper. So far, for me, it has all been stuff I have around my house. Number of pages/number of lessons: The Teacher Guide has 12 Chapters, 266 pages; the Student Activity Pack has 144 pages, with 10 Lessons (each lesson can take two weeks) and the Fold-N-Go Grammar Pack; the Timesaver Pack has 28 pages. Is the product secular/religious? I haven't read the entire book, but thus far I have not seen anything offensive to the religious, nor overtly religious (which would offend secular folks). How much teacher prep is required? Well, I definitely read through the lesson, print some things out, collect supplies, and maybe sometimes do some cut and pasting in advance. But it is oh so worth it! What do I like or dislike? Well, I said it elsewhere in the review, but I dislike that I received a digital version, even though I like the digital version. (I don't like all the printing, and without printing things out, I get kinda lost on where I am in the three different books.) Other than that, I totally like LOVE everything. So far I haven't found anything about the program that could be improved. It is excellent. I would recommend the product to anyone who is struggling to get writing jump-started in their homeschool program, and this particular WriteShop Junior I would recommend to anyone with students 3rd through 7th grade, depending upon the student's writing experience and past materials covered. Does my son like/love it? Nah, but I think it will grow on him. It's hard to get him to *like* anything that isn't Science, and he doesn't like all the Science programs either! 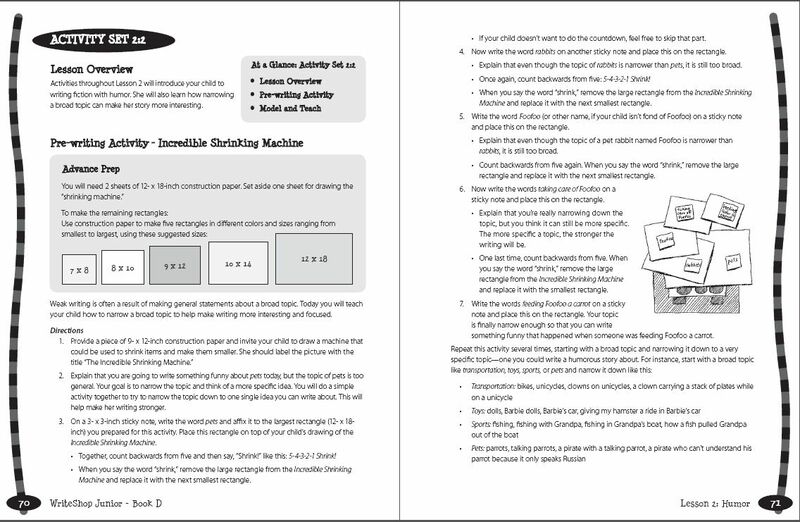 DISCLAIMER: I received a digital download of the Write Shop Junior, Book D Teacher Guide, Student Activity Pack, and Time Saver Pack in exchange for my honest review. I did not receive any payment for my review. This has been a TOS Homeschool Crew Review. To see other TOS Crew reviews, go to the TOS Homeschool Crew Blog page for this product, HERE. I have a son that generally does very well at math. He is advanced. I do not push him; he has just always been advanced. In Kindergarten, in Sunday School, the teachers would hand out pictures for the kids to color, and my son would turn the paper over to the blank side and write out addition problems and their solutions on the clean side. Nevertheless, even though he is good at Math, it has gotten to the point where he hates it. (If you've read my other posts, he actually hates most everything right now, especially if it wasn't his own idea, but more on that in another post.) Setting his learning issues aside, I was concerned about his Math because, although he generally does quite well, I had become convinced that he really doesn't have those Math facts down... not really. I learned in March that the TOS Crew had the opportunity to try out CapJaxMathFax, and I jumped at the chance. CapJaxMathFax is a software program available from Starboard Training Systems, which is headed by Jack Fretwell. Jack Fretwell is Capt. Jack, although it appears to be a title as in captain of his sailing vessel, not a military captain. From their website's "About" page, Mr. Fretwell "earned a Master's degree in Educational Technology and has spent over thirty years in education and computers." Mr. Fretwell has been heading up CapJaxMathFax for ten years, and under his leadership many children have developed stronger Math skills, and corresponding confidence in Math. "Starboard Training Systems' goal is to help organizations that teach, train and mentor" children, so that not one is without basic math abilities. (That means they also want to help home schoolers.) I like that goal! CapJaxMathFax is systematic, in a way that takes the student from beginning skills to mastery in all four basic operations. It simultaneously determines the student's level and objectives for practice, and then leads the student to success working independently at his or her own pace. CapJaxMathFax accomplishes its goals in a way that leaves the student feeling good about the process. There is a balance between challenge and success, pressure and achievement. CapJaxMathFax has a good feedback and evaluation system. 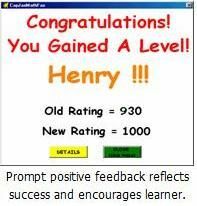 Not only does the student receive feedback of his or her own progress, but also the parent/educator receives progress reports, so the "independent" work can be monitored by the mentor. To add special interest, praise messages that appear at the end of rating sessions sometimes include a bottle icon. CapJaxMathFax is a downloadable math facts program available to you for $29.95. This fee pays for a license fee to use the program for 12 months. You can order a Free Evaluation Package to try this product out before you buy. This supplemental program will help your student memorize their math facts, which will help them in their required Math program at home and at school. This program adapts to the student, so your student can begin it at any age, any grade, and it can be beneficial for students from 1st grade (K, even) through high school, depending on the situation. I received a 6 month license key to CapJaxMathFax in exchange for my honest opinion in my review; I did not receive any pay. This has been a TOS Crew Review. To see more reviews by other TOS Crew members, go to the TOS Crew Blog page for this review, HERE. I always welcome your comments on my reviews and other blog entries, so feel free to comment. The TOS Homeschool Crew was pleased this month to have the opportunity to review Go Science DVDs, created by Mr. Ben Roy. Go Science is a creation-based DVD series offered by Library and Educational Services (LES), a wholesale supplier of books, CDs and DVDs and more, which are available for purchase by schools, libraries, churches, educators (home schoolers), and resellers. LES has been committed to excellence in customer service and product selection for over 30 years! When you call them, a real person answers the phone! I have been purchasing Adventures in Odyssey from LES for decades! I have also purchased many books and school supplies from them over the years. To see my links below on the LES website you might need to create or log in to your LES account. LES offered the TOS Crew the opportunity to select two DVDs (per reviewer) to use with their families to review. The available Go Science DVDs are: Volume I: Motion: Discovering the Laws of Gravity and Motion; Volume 2: Simple Machines: Sound & Weather; Volume 3: Magnetism, Electricity, Engineering and Design; Volume 4: Chemistry, States of Matter, and Life Sciences; Volume 5: Air Flight, and Volume 6: Water, Space, and Solar System. For my son's interests, I chose Volumes 3 and 4. Volume 3 has 14 experiment segments in it, and Volume 4 has 11 experiment segments in it. All the information on the various DVDs is at the LES website through the links above to each volume. Go Science DVDs are promoted as being appropriate for ages 6-14. The purpose of Go Science DVDs is to present science to children in a manner that will help them know and understand that science is cool, and it was created by our wonderful Creator! The subject matter contains experiments and subject matter that can hold the interest of these ages, even down to the interest level of a 2 or 3 year old! However, I would say the presentation and demeanor of Mr. Roy lends these videos as being more appropriate for pre-school through early elementary than upper elementary through middle school. It would take a very tolerant 14 year old to sit through these demonstrations, where there are conversations like this: "Glendy, can you tell the boys and girls what this object is?" Glendy: "A light bulb." Mr. Roy: "That's correct! It's a light bulb! How many of you have light bulbs around? Oh, yeah! Lot's of people have light bulbs around..." Or, "Hey, have you ever heard sound?" Mr. Roy is enthusiastic, but he seems to talk down to a pre-school level in these DVDs. For this reason, I think these DVDs will more easily hold the attention of kids 3-9 years old. There is material in these DVDs that can't be duplicated at home that is great for 10-14 year olds to be able to see, but I just wish he wasn't presenting it the way he does. I can't get my 12 year old to tolerate it. This series was created for a television show called "Learning Time", and because of this each video clip stands alone. They strike me as clips that are also best viewed alone. Because each clip has a similar introduction and conclusion (like a television show does), these introductions and conclusions become redundant if you sit and watch the entire 25 minute DVD in one sitting. For some reason the volume level at times varies from one DVD clip to the next, which is another reason watching just one clip at a time makes sense. The experiments in these DVDs can't be duplicated at home. Because of that I consider the DVDs to have value for the students. 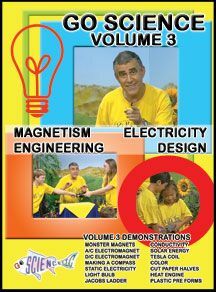 My recommendation would be that a fun day's science could be created around each DVD clip (by the parent) so that the days science would consist of watching the Go Science movie clip for the day, and then the mom could present the students other hands-on experiments of a similar nature for the kids to do that day to complete the science class. Each movie clip ends with Ben Roy's wrap-up statement that, "Every time we learn something new about science, we learn something new about our Creator, God!" I appreciate Mr. Roy's heart for bringing children to God, but I don't feel this line is tied in very well. When the six year old learns that red and blue mixed together make violet, she doesn't necessarily know anything new about her Creator, just something about His creation... Maybe I'm just contrary... But if a program is going to end with that statement, it is my opinion that it should also include the statement of what today's experiment(s) demonstrated about the Creator. 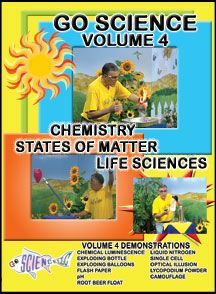 Go Science DVDs are available through LES for $8.97 per DVD, or for $$47.95 for a six volume set. I received two Go Science DVDs in exchange for my honest review of the product. I did not receive any money for my review. To see more TOS Crew reviews of Go Science, go to the TOS Crew Page HERE. This has been a TOS Homeschool Crew Production. Please let me know your thoughts! As a Christian, I have always sought to make study of the Bible a priority in our day, and sought to teach our other subjects in ways that interweave the information with Biblical truth. This past year my son has really taken personal responsibility, through his AWANAs materials, for his studies, his Bible memory, etc., and he has done well. As our AWANA's year was nearing its end, I was offered the opportunity to review the Judah Bible Curriculum. I thought, "Great timing!" I was at a pivotal point where I could either go back to my previous format (daily hymn, Bible reading, and memory work), or switch to something else. I was very pleased that I was chosen to be on the review crew for Judah Bible Curriculum. On reviewing their website, I found a wealth of information. Particularly helpful was "Why JBC is Unique". A Principle Approach curriculum for Bible class. Develop a comprehensive knowledge of the Bible. Build strong, Godly character in your children. Study the hand of God in the lives of individuals and nations. For homeschool, Christian school, Sunday school. Teach your children living Biblical principles to guide their lives. Apply God’s word personally in every area of life. The Bible is the textbook. Judah Bible Curriculum audio course, 8 separate lectures, averaging about an hour each. Positive #1: Judah Bible Curriculum is a K-12 program! It's all there! For one price, you have it all for all of your children for their entire school career. For the very youngest students, you work through it with them, and as they mature you teach them to study independently, setting them up to know how to study and learn from the Bible for their entire lives. Well, the day it arrived was exciting! I immediately downloaded everything, and then began to peruse the materials. Well, that was hard for me. I couldn't quite grasp the content while reading it from my computer screen, so I started printing stuff out. As I began reading, it quickly became apparent how very little I know about "The Principle Approach". I thought I knew more than I did. I've been homeschooling for 21 years. I first heard about The Principle Approach about 19 years ago, when a friend told me about Dorothy Sayers and The Lost Tools of Learning. At that time I was a fairly new home- schooler, with very little college under my belt, and was still dealing with confidence issues. I wasn't ready to learn what The Principle Approach was all about, let alone ready to implement it. Now I am at a place where I can consider it, but am finding myself a slow learner, and am finding it difficult to carve out time needed for the learning. Positive #2: I really like the curriculum's plan. The Bible is broken down on a six-year rotating plan, where each year has its own plan that covers highlighted sections from the Old and New Testament on a series of rotating themes: Creation, Plan of Redemption Begins; Kingdom of Israel (those three are Old Testament); Kingdom of God, and Early Church (those two are New Testament). There are actually 17 Bible Keys that are spread out through the five above-mentioned themes (see "Positive #2"), spread out through K through 6th, and then repeated for 7th through 12th grades. The 12-year Scope and Sequence can be viewed HERE. Scripture memory is also an important part of the plan. Notebooking is also part of the plan. I had already been covering these three, in my own haphazard way, but this plan will take what I had been presenting previously, and clarify it for my young scholar, to help him make sense of it in ways that will better help him to develop a Biblical world view. Positive #3: The curriculum contains an explanation of The Principle Approach to American Education that I found extremely helpful and inspiring, with additional listed resources. Negative #3: Back to the topic of Notebooking -- I was disappointed in two ways with the Judah Bible Curriculum Notebook Ideas: 1) It is only ideas for Elementary. I think notebooking can be just as helpful right up through high school, so I wished it has contained upper grades as well; and, 2) The Notebook Ideas pages contain photocopies of ideas that have been implemented in classrooms, but it only shows them filled in -- it does not provide the blank forms to use. So to implement those notebooking ideas, the teacher needs to recreate the notebook page blanks. ::sigh:: I want as much provided for me as possible -- you know, make it easy for me please! Positive #4: The appendices at the back of the manual are amazing! Part of the materials are charts that you look at that correspond to the audio lectures. Part of the materials are a Biblical timeline from the Garden of Eden to the year 400 BC. It is fabulous! So, overall, I am at the front end of using this material and am telling you that at the front end it entails a lot of work. I believe that ultimately the work will be worth it, but if you are considering this curriculum, please know the time involved at the front end so that you are not shocked. Cost-wise, if you calculate this even for one child (which is what I have), even if you aren't starting until 7th grade (which is our grade next year), at a cost of $44/six years of usage, that comes to $7.33/year, which is a great price. But, if you are using it for 12 years, it is $3.67/year. If you are using it for two students, that comes to $1.83 per student per year. The more students you have, the less it costs per student per year. It is very economical! So, overall, other than the fact that I didn't know I would need to set aside so much time to implement this, and other than the fact that I wasn't in a mood to work hard on curriculum implementation right now, I really recommend this material, especially if you are looking for some fresh assistance, and if you already like the concept of notebooking. I received a download set of Judah Bible Curriculum in exchange for my honest review. I was not paid for my review, and this is my personal opinion of the product. I tell my own opinion, whether it is good or bad. This has been a TOS Homeschool Crew Review. Go to the TOS Homeschool Review page to see more reviews of Judah Bible Curriculum. Let me know what you think. Throw me a comment. Thanks!